Fans in the city of Cincinnati know that rocking the orange is nothing to be ashamed of. This underutilized color makes any fan apparel pop, and that’s certainly the case with our solid orange game bib overalls. They’re made of the same 100 percent cotton design as our striped styles which makes them comfortable and breathable in any weather. Adjustable shoulder straps make it easy for anyone with a long torso and waist snaps let you step in and out of the overalls in just a few seconds. 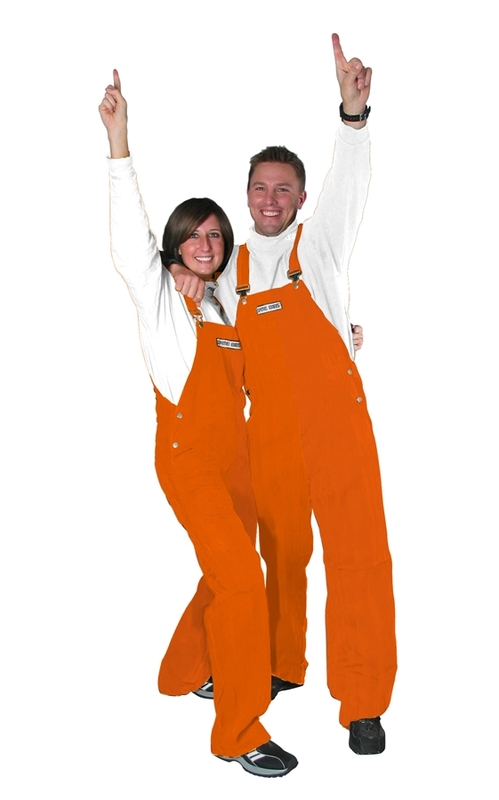 Be loud, be proud and show your ferocious team spirit with these orange game bib overalls. They’re more fun than a boring old jersey and cost a fraction of what a jersey does. Pick up your pair today and check out our full selection of orange fan apparel here! They shipped the package out quickly and the product is exactly what they described. Very satisified. I am going to have to return them due to them being too big. I so needed them by the 18th. I cannot thank you enough for working with my son and I on our order. TOP NOTCH professionals and WONDERFUL quality! We appreciate your service and product! Quick delivery and great fit!!! Excited to wear them as the Tigers play. Go Tigers!!!!! They are the perfect color! After Christmas we will know if they are the perfect fit. Arrived super quick and ordering was easy! Might need my own pair! !